Architects Janna Levitt and Dean Goodman designed a house that could easily shift to accommodate children, future renters and, one day, their golden years. When a strange young man entered her bedroom, Kelly Rossiter wasn't entirely surprised. "He had had a bit too much to drink," says Rossiter, who lives in Toronto, "and had gotten lost on the way to the front door." On the way, that is, from a party at her daughter's place; Rossiter and her husband Lloyd Alter live below their daughter Emma, now 28, in a 1913 house that's been split into two apartments. The door that links the suites in their home is usually left unsecured. "But after that night, I began locking the door whenever she had a party," Rossiter says. That incursion was a "rare hiccup" for the three family members, who occupy the same house that Alter, 63, and Rossiter, 57, have inhabited since 1984. Recently, instead of trading it for a condo in another area, they hired David Colussi of Workshop Architecture to divide the rambling building into a duplex. Now they live in a suite in the first floor and basement; Emma is upstairs with her fiancé and a roommate. Janna Levitt and Dean Goodman designed their family home so that part of it could be converted into a rental when their children moved out. Like a growing number of Canadians approaching retirement, Alter and Rossiter have taken a creative approach to the architecture of the "empty nest." Rapidly rising housing prices – particularly in Toronto and Vancouver – are squeezing the middle-class expectation of home ownership for young adults. At the same time, their parents, people such as Alter and Rossiter, are not always eager to move into apartment living or to give up on the advantages of a familiar neighbourhood. Such adaptability can be built into a house's architecture. 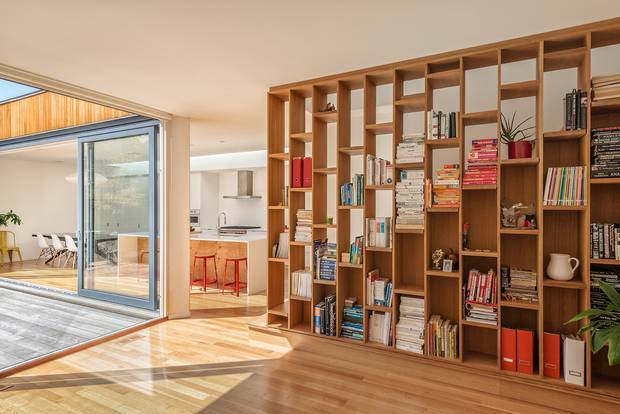 One example is the Grange Triple Double, a house by Williamson Chong Architects: Their clients, a Toronto couple in their 30s with a young son, decided to move in with the husband's parents. They built a bespoke house that would accommodate them all together with rental income – and then change, multiple times, as the family's needs evolve through the decades. "The ingredients for this kind of house," explains partner Betsy Williamson of Williamson Chong, "are spaces that are discrete yet flexible." The Triple Double, at about 3,200 square feet plus basement, sits on a corner; it is a three-bedroom, three-bath home which spills across three levels – and abuts rental space located on the ground floor and in the basement. The tenant space can be configured as one or two apartments; half or all of it can also be joined to the main house with the removal of cabinets or wall sections. In addition, one of the house's bedrooms can be closed off as a semi-private area for the older residents. In time, the architects imagine that the house could take many different configurations; for instance, one or both of the grandparents might move into the main floor rental space. The Grange Triple Double, a house by Williamson Chong Architects, was designed and built to change, multiple times, as the owners’ needs evolve through the decades. From the architects' point of view, such adaptability is fairly easy to design. The house's heating and ventilation systems can be separately controlled in each of three potential units; extra sound insulation provides a buffer of privacy. But the biggest consideration is, as Williamson explains it, a matter of space. "You need rooms," she says. "You need rooms that are closed off that can be opened up to each other." This logic can be applied to houses that don't have the scale or the unusual geometry of the Triple Double project. Janna Levitt and Dean Goodman of LGA Architectural Partners, who are married and have two children, designed their own house a decade ago, when they were in their early 50s. "When we moved in, we had teenagers," Goodman explains, "so we tried to figure out, what kind of house would work for that age of our family and what would work after that?" That basement has room and the plumbing rough-ins for a kitchen; it also has a space for a front door and staircase which is, for now, buried under soil in the garden. ("We thought, if we give the kids their own door when they are 14 or 15 years old, we'll never see them," Goodman explains.) Now the kids have moved out, and the couple is preparing to rent that space out, providing a source of income. And the upper levels, with about 1,600 square feet, two bedrooms, are still larger than the average Canadian house of 50 years ago. Goodman says he and Levitt are happy to reduce their ecological footprint, and simply don't need any more space. There is a lesson in this: Design matters. Levitt and Goodman are excellent architects, and their house is efficiently planned to be comfortable and adaptable despite its relatively modest size. "It's important to think about what you're building for," Goodman says, "not just right now, but in the longer term. And how much longer?" The upper levels of Levitt and Goodman’s house, with about 1,600 square feet, are still larger than the average Canadian house of 50 years ago. That raises the question of old age and a potential loss of physical mobility. Levitt and Goodman will live, still, on two levels; this goes against the emerging wisdom of "retirement communities," in which people are choosing to retire to houses that are often on one level and wheelchair-accessible. Kelly Rossiter and Lloyd Alter have likewise chosen to live on two floors. "Older people, when they move into single-family houses in subdivisions, they're setting themselves up for failure," he says. "It's a hell of a lot likelier that they'll lose their keys before they lose their ability to walk up the stairs. "This is one solution: this re-intensification of our neighbourhoods." Levitt and Goodman plan to live on two levels into retirement. As Alter correctly points out, the conversion of houses into apartments (and back again) is nothing new – especially in Toronto, where such ad hoc adaptations have always provided a major portion of the city's rental housing. But for upper-middle-class families, they now make sense. "Now we're going into a generational change where the kids don't have enough money," Alter says, "and the parents have the house and don't need it. "If you've got an 80-year-old house in Vancouver, being able to move into a new building that's energy-efficient – that's appealing," says Lanefab's Mat Turner. "They can stay in their neighbourhood, in a house that's custom-designed for them." This sort of promising equation may be enough to break some middle-class expectations about dwelling and family. Alter and Rossiter, with their upstairs-downstairs living in Toronto, are finding that their friends love the idea. "People come, they see it, and they say, 'I'd love to do this,'" Alter reports. "'If I could ever get my kids to go for it.'"